If you're looking for a foam machine rental in West Palm Beach, Fort Myers, Naples or any of the other surrounding areas in South Florida, Busy Bee Party Rentals can deliver. For your foam party rental needs you don't have to settle for a typical, hot and sweaty dance club. You can be covered from head to toe with our great foam machines just about anywhere. 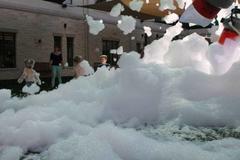 With our great foam machine, everyone will have loads of fun. Perfect for graduation parties, backyard birthdays or countless other events including church functions and company picnics. You may be thinking that foam is soap and water so you're going to get cold and wet. Well, not with our foam machine. The solution in our foam machine is 90% air, made with non-toxic, biodegradable ingredients and is environmentally friendly, allergy free and environmentally friendly. Be sure and check out our obstacle course rentals that work great with our foam machine rentals. Busy Bee Party Rentals has the best foam machine rentals for our customers in West Palm Beach, Naples, Fort Myers, Loxahatchee, Wellington, Clewiston, Belle Glade, Lehigh, Immokalee and other surrounding areas in South Florida . Browse the selections below and click the image or title for more information and to request a quote. We welcome all questions, please contact us for inquires and orders. Click below for the best Foam Machine Rentals in West Palm Beach, Naples, Fort Myers, Loxahatchee, Wellington, Clewiston, Belle Glade, Lehigh, Immokalee and other surrounding areas in South Florida.